According to new data from leading real estate company CB Richard Ellis, vacancy rates fell in 10 out of 13 of America's largest office markets in the second quarter, with Houston and Boston charging the decline. The report shows that the vacancy rate for Houston offices is now just 12 percent down from 12.5 percent and Boston experienced a similar drop from 12.6 percent to 12.1 percent. But New York has the lowest overall vacancy rate, with just 7.6 percent of office space in need of tenancy, which is unchanged from Q1. 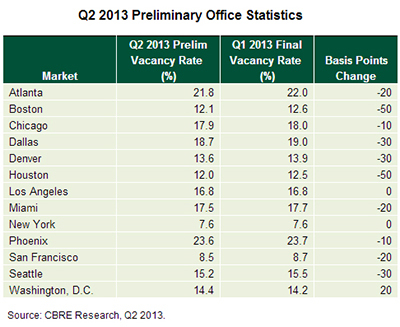 San Francisco is next with an 8.5 percent vacancy rate, down from 8.7 in the previous quarter. Washington D.C. was the only major market to record an increase, rising to 14.4 percent, due to "decreased activity by the federal government." "Continued job growth and minimal new office development is leading to tighter conditions in most major U.S. office markets," said Brook Scott, CBRE's interim head of research, Americas. "Stronger consumer confidence and a resurgent housing market are helping to strengthen industrial markets, but the sector still faces headwinds from a slowdown in economic activity outside the U.S."
Rental rates "continued to trend higher and concessions remained stable in most markets due to moderate job growth," the consultancy reports.